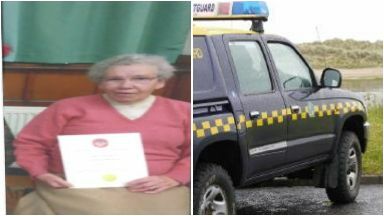 Phyllis Milne, 86, was reported missing from the Quarryhill area of Keith, Moray, on Saturday. Emergency services looking for a missing pensioner have focused their latest search efforts around a river in north-east Scotland. She was last spoken to by a family member at around 10pm on Friday. Police, the coastguard and fire and ambulance crews have been involved in searches for the missing woman over the weekend. On Sunday, the coastguard and specialist search officers from Police Scotland's operational support unit focused their searches around the River Isla, north of Keith, towards the River Deveron, after receiving information from the public about sightings of Ms Milne. Inspector Neil Campbell said: "I would urge anyone who believes they saw Phyllis on Saturday, and has not spoken to us, to come forward. "Any information, no matter how small you may think it is, can assist us with our inquiries. "We are grateful to the community for their support and offers of assistance with the searches. "Due to the terrain we are searching and the associated risks, as well as the weather conditions, we are continuing the searches with our specialist officers. "If public searches are to be arranged, we will of course let the community know." The missing pensioner is described as being around 5ft 6ins, of medium build, and has thick, short, curly grey hair.